Unusual, quirky and completely bespoke, a custom cryptic crossword is the ideal present for the wordsmith in your life. If you'd like one of the country's top crossword compilers to create your puzzle, we've got Boatman on hand; alternatively, we've got a bank of setters ready and waiting to craft elegant and witty puzzles. Follow us on Twitter - @CustomCryptics! What goes into a custom puzzle? A custom puzzle will usually have about thirty clues in it, of which at least half will refer to some element of the theme, either in the clue or in the solution. The remaining half of the clues will be 'normal' cryptic clues - necessary because it's pretty much impossible to compile a symmetrical grid from just themed words. We usually set 15x15 symmetrical grids, just like in the newspapers, but sometimes branch out to jigsaw-style puzzles (where the grid isn't numbered and, in the immortal words of Araucaria, the solutions should be 'fitted into the grid jigsaw-wise, wherever they will go') or novelties (a recent Boatman commission took the form of a game of Scrabble, for example). You’ll receive your puzzle as a .PDF file, with solutions and explanations of the wordplay on a separate page. We can optionally arrange for a framed presentation copy to be created and sent to you. Our bank of compilers can usually create a custom puzzle for you within a month, but the more time we have, the better. Please note that Boatman generally needs more notice - two to three months is normally enough, but he can only field a certain number of enquiries per month, so may not always be available. Choose whether you'd like Boatman or one of our bank of compilers to set your puzzle for you. Give us as much information as possible on the person it's intended for. The more possibilities we have, the more we can use relevant information in the clues and answers. We'll get back to you within a few days to confirm your enquiry and let you know some thoughts about how we might work up the puzzle. (At this stage, we just want to make sure we're not going down any blind alleys!) If you're happy with this, it's then that we'll ask you to pay. 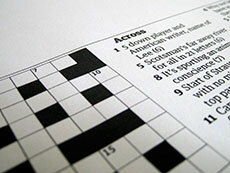 Once we've received payment, we'll compile the crossword for you; we'll send you the completed PDF within a few weeks. If we've inadvertently referred to anything that you'd rather not see in the puzzle, there's normally time for a few adjustments if necessary. For our bank of up-and-coming setters, we operate a 'taxi-rank' system, so you'll be assigned the next available setter. A puzzle from one of them costs £150. For corporate pricing from either a professional or bank setter, please get in touch. When you commission a puzzle from us, we'll deliver it as two PDFs - one with a blank grid and clues, and one with the answers and explanations.